I had to share this shot of my sister Barbara. She never eats breakfast normally but as it was about 10.30 she said it was brunch. When she ordered the Light Breakfast I laughed and said did she realise what was in it? She said it would be fine. This is her face when the huge plateful was placed in front of her. 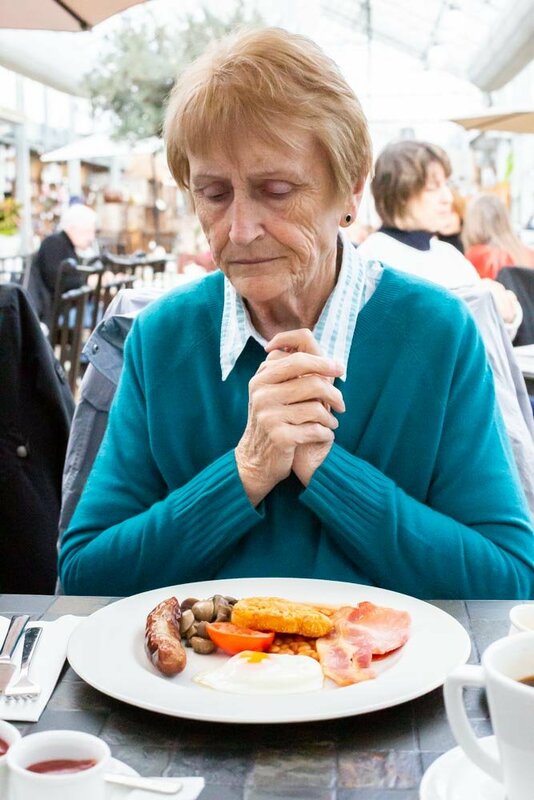 I think she is saying her prayers and asking how on earth will she manage all that food!! Of course she couldn't manage it all and there was quite a lot left on the plate. It definitely was not a Light Breakfast as described!! Prayers for courage...as you suggest. Hope she enjoyed that which she did eat. It certainly says " Ooh , my God , help me ! " It does look good though :). Overwhelmed? How did she do? Could she eat it all. You really captured a great expression on her face! Barbara’s expression says it all. That does look like a lot of food, oh my! Absolutely priceless expression, says it all. Love it, love it, love it. Looks good, but not light, no! Nice capture of your sister.